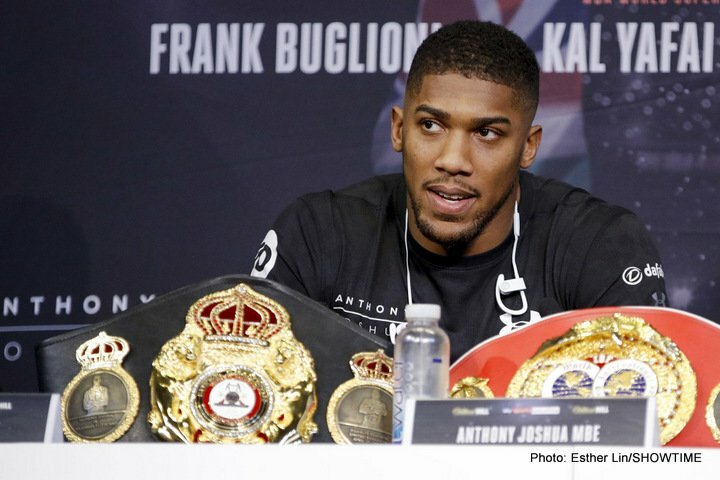 Fans have both read and heard the various insults Tyson Fury has hurled Anthony Joshua’s way; the soon to return, unbeaten lineal heavyweight champ vowing to do all manner of things to the reigning WBA/IBF champion when they meet, possibly next summer. And Joshua, usually a reserved, polite and fully respectful person, has had enough of it. AJ says he is no longer able to respect Fury and that Fury has discredited everything he has accomplished. Fury of course, is critical not only of Joshua, but of every rival or potential rival of his and maybe he has managed to get under Joshua’s skin already. If this is the case, then just imagine what the pre-fight pressers and face-offs will be like for Joshua. But Fury-Joshua is a fight everyone wants to see, and Joshua knows it. Fury is expected back in the ring around April time, all being well, and everyone is interested to see who the comeback opponent will be and how sharp Fury will be in his first fight in around two and-a-half years. Rest assured though, a Fury-Joshua fight will not go away as long as both men are unbeaten, and there will be some serious bad blood in the air right until the first punch is thrown. Who wins? That question cannot be answered until we see how much of his skill-set Fury has retained. But this much can be said, the Fury who beat Wladimir Klitschko gives Joshua a very, very tough time indeed.